At first I was worried because this pillow is smaller than my others and seemed pretty hard - like the one I bought at ***. But then I slept on it. I woke up this morning feeling like a new woman!! My neck and back seriously felt so much better. I will only be purchasing this fancy pillow for the rest of my life. Definitely much better than the *** pillow I gave to my dogs. 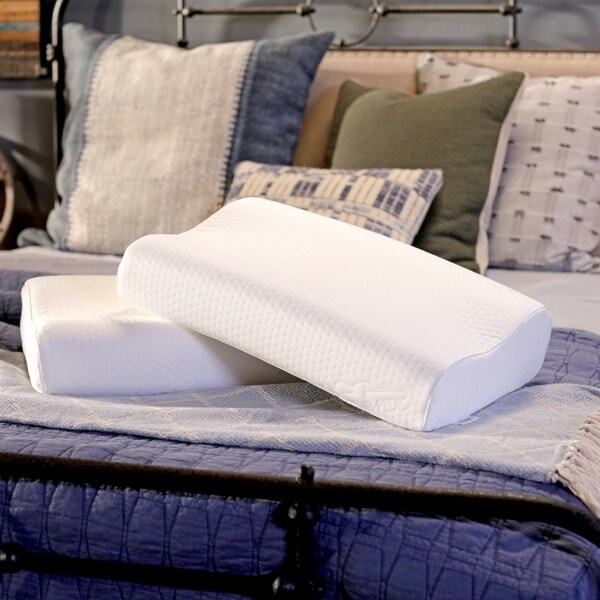 The TEMPUR-Neck gel memory foam contour pillow is designed with an ergonomic shape and several comforting layers of memory foam that regulate temperature, provide pressure relief, and offer antimicrobial comfort. The layers collaborate to relieve painful pressure points while properly supporting you while you relax. Dimensions 19.0 In. X 12.75 In. X 3.0 In. Finally I am able to sleep though the night with this temper pillow. Its firm enough that it supports my neck and head but is still incredibly soft. Goes right back to form, super high quality product. You get what you pay for! The TEMPUR-pedic neck pillow has allowed me to finally sleep without waking every one or two hours which had been my problem for several months now. But after the first night using this pillow, I was pleasantly surprised that I had actually slept pretty well and that I awoke with no heavy nagging pain around my neck and upper shoulders. This pillow really works for me and my sleep issues. I am so glad that I finally took the plunge and purchased it. I was not so sure even after I read all the positive reviews about it that it would be the answer for my sleep problems. These had gotten to the point where I even started to dread having to lie down for going to sleep as I knew that the pain would begin soon afterwards. I am so thankful that a product like the Tempur-pedic neck pillow has alleviated my nightly "nightmarish" experiences associated with lying in bed. It is so nice now to look forward to sleep without dreading it due to my osteoporosis in my neck. I am so thankful that, after tossing and turning too many times, I no longer need get up and out of bed in exasperation to take pain medication and hope for some relief in order to fall asleep. I can't say this enough: I am so glad to have found and purchased the TEMPUR-pedic neck pillow. It is truly a life- saver for me! Pillow was little smaller than I expected, but also the correct size recommended by our local Tempurpedic dealer. It's also considerably smaller in depth than the cervical pillow I've been using for several years, but I seem to be sleeping better than usual. As a result I also invested in a memory foam mattress topper. I think I ordered it from Overstock, but don't see it listed above. Wherever I bought it, it arrived a couple of days later; however, I didn't realize set-up instructions called for the mattress topper to be allowed to breathe for 48 hours. Although I could have slept in a different bedroom, I ended up sleeping on the floor of my master bedroom for the next 2 nights. Love this pillow 😍 Contours will to my neck. My wife and I like these pillows. We get a better nights sleep after using these high quality pillows. They cost allot more than the other cheap pillows but are worth every penny to me. I don't wake up hurting anymore. This pillow was a life saver after having neck surgery. It is very comfortable but did have a slight odd odor upon arrival. Took some airing to get rid of the odor but overall a good purchase. This is a nice neck pillow. I bought it for my husband. He needs something with a higher "bump" for support. We did pass this along to my teenager who does like the way the pillow supports her neck. Still looking for the taller support neck pillow. Fabulous purchase! My husband has had one of these pillows for at least eight years. I jokingly call it “the brick”. However recently, one morning after he left for work and I still had another hour to sleep, I grabbed his pillow to try it because my neck ached so bad. I easily fell back to sleep, and when I awoke, I feel pretty good! So I started doing that regularly, and I felt a difference. Overstock knocked down the price two days after I purchased this, and they honored the price reduction. I am very pleased with this purchase. Too hard. I couldn’t make it through the night. I couldn’t get comfortable. It had a awful smell that after 3 months I can still smell. I wish it was returnable. A waste of money It now sits in a chair in my guest room. My husband and I can NOT sleep without this pillow! It was time for him to get a new one and Overstock had it for 33% off of retail; which is quite a savings. Thanks! My kids love these. I had to buy a second one because they were fighting over who got to use it as they claimed it helped their neck pain so much. I could not sleep well for a while and I was looking for a good pillow. I ordered this based on the description and reviews. I am very happy with it when I receive it. It's exactly what it is described. Good quality and very comfortable. I have used it for a few years and it still keeps its shape. I will recommend this. Awesome pillow, super soft and comfortable yet with the needed support. I am petite, so this pillow is great for me. It is a little small in size, but I like it! "i have a pressure ulcer on my left ear. I can only sleep on right side because of hip problems so can this pellow help keep ear off pillow?" This pillow is designed for back or side sleepers with an extra firm feel. Its design follows the natural curve of your head, neck and shoulders when you are sleeping, and your ear will touch the pillow when sleeping on your side.